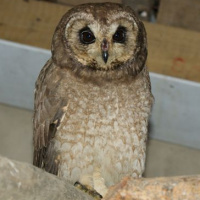 The Marsh Owl is a medium-sized owl with a rounded head and small erectile ear-tufts. 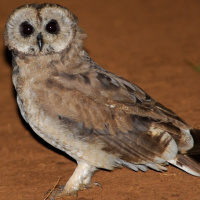 It is also known as the African Marsh Owl. Typical call - Lac de Sidi, Bourhaba, Morocco. April 2012. © Tero Linjama. Description: The facial disc is pale buff, with a distinct dark brown rim with buff speckles. There is a dark brown area around the eyes, which are also dark brown. The cere is grey-brown and the bill blackish-horn. Ear-tufts are earth-brown and quite small, often not visible, and set near the centre of the forehead. Upperparts are plain earth-brown, crown and nape are finely vermiculated buff, and uppertail-coverts are barred buff. The primaries have plain, pale tawny-buff bases, contrasting with a dusky patch at the wrist. The rest of the flight feathers are barred dark brown and tawny-buff. The tail is dark brown, barred pale buff with a whitish tip. Underparts are brown, finely vermiculated buff, becoming more uniform pale buff on the thighs, belly and undertail-coverts. Underwing-coverts are buff with a dark brown wrist patch which is very conspicuous in flight. 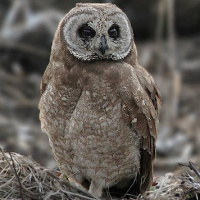 Tarsi are feathered pale tawny-buff and toes are covered with pale buffish plumes, leaving the dark brown tips bare. Claws are blackish. Males are generally paler then females, and there is some individual variation in tone. Size: Length 31-38cm. Wing length 284-380mm. Tail length 132-186mm. Weight 225-485g. 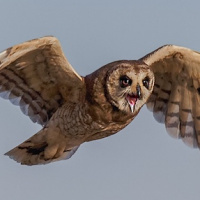 Habits: The Marsh Owl is mostly crepuscular and nocturnal, but sometimes active during cloudy days. Roosts by day on the ground in a hollow among grass or other vegetation. They may be aggressive near the nest, or feign injury in order to distract potential predators. May roost communally, especially outside breeding season. Voice: Most commonly a hoarse, grating call sounding like the noise produced by breaking a dry branch by bending it slowly - kerrrrrr. It is repeated at variable intervals. Also gives a sequence of croaking, raven-like calls on the wing - quarrk-quarrk-quarrk. Hunting & Food: Normally feeds on small rodents, but often switches to small birds if rodents are not available. They also take other small vertebrates and insects. Prey items include mice, voles, rats, shrews, young hares, bats, birds up to the size of small ducks and doves, frogs, lizards, scorpions, beetles, grasshoppers, etc. 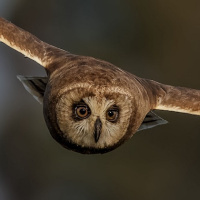 Most prey is captured by flying close to the ground with slow, powerful wingbeats, interspersed with fast swerves and hovering, before dropping on the victim. Flying insects may be hawked in flight. 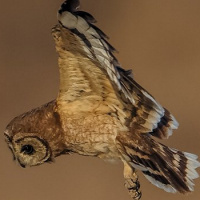 Breeding: Marsh Owls are monogamous and territorial. They may nest in loose colonies. Territories are normally 0.8-2.5 square km but may be even smaller in denser populations. Hunting areas of neighbouring pairs may overlap. 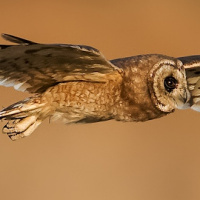 The male claims territory by circling over it, clapping wings and croaking. Nesting normally occurs towards the end of the wet season. The nest is a hollow within a patch of tall grass or weeds, often beside a bush and with an 'entrance tunnel' from one side. Vegetation is often pulled over by the female to form a canopy. The depression itself is lined with some dry leaves to from a pad. The female lays 2-6 (normally 3) white eggs (40x34.1mm average) at intervals of about two days, and incubates them alone starting immediately. Incubation period is 27-28 days for each egg, and during this time she is fed by the male. After hatching, the chicks open their eyes at about 7 days. They leave the nest at around 18 days while still downy, and scatter in the surrounding vegetation. During this time the parents locate their young by their calls and trampling movements in order to feed them. Fledging is at 29-35 days old, and they are fully feathered at 70 days. Both parents care for them for some time before they become independent. Habitat: Open country from coastal marshes to savanna, also inland marshes, moors and montane grassland. Ranges from sea-level up to about 3000m. Favours terrain with short vegetation and some patches of long grass or weeds. May be found locally in rice fields and drainage strips in wooded savanna, sometimes in open areas near or even in human settlements. They are absent from forested areas, rocky landscapes and deserts, and avoid extensive long grass. 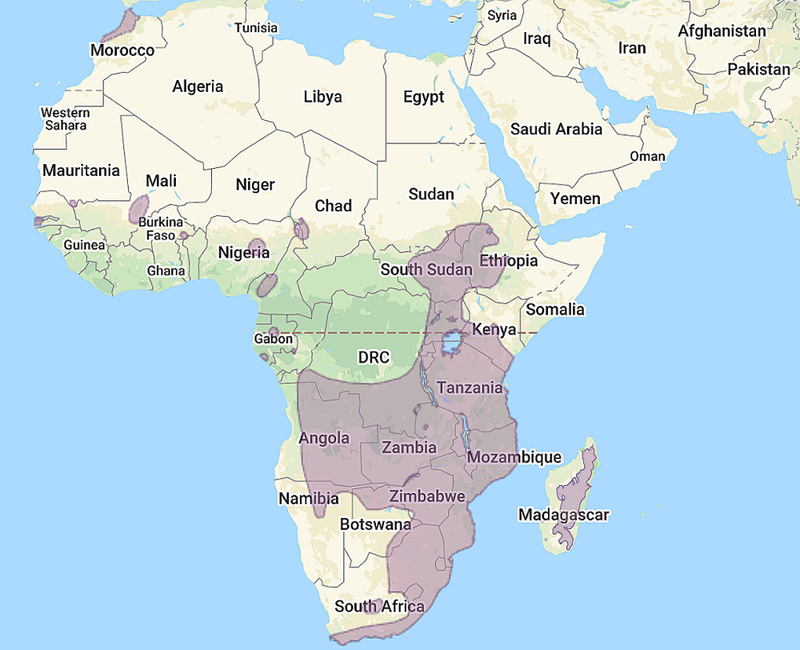 Distribution: Africa and Madagascar. An isolated population exists in extreme northwest Africa in Morocco. Patchy distribution south of the Sahara from Senegambia and Ethiopia to the Cape. They are generally resident, but partly nomadic within sub-Saharan Africa. Original Description: Smith, Sir [Dr.] Andrew. 1834. South African Quarterly Journal (S. Afr. Q. J) (2): p. 316.